Within the larger room in the Harbeth suite was their 40.1 driven by a Luxman integrated amplifier (I believe) that had a full, warm and inviting sound. These large monitors ($13,000) were sitting atop beautifully crafted wood stands from ResonantWoods.com in New Hampshire USA featuring exquisite joinery that left lots of open air beneath the Harbeth. 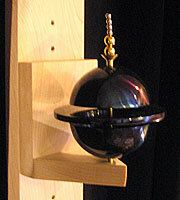 I expect Brooks Tanner would be willing to make a custom wood stand if you need something special like this. On a more curious note, I noticed a number of tuning devices on the walls that reminded me of Tibetan singing bowls. I'll have more to say about them much later on. In a rather expensive room I met Jim Aud from Purist Audio Design, a company that has made very high end cables featuring fluid and gel filled casings for many years. He figured he had about $20,000 worth in the system that was kicked off with a Marantz SACD player used as a transport for a Stahl~Tek Vekiandac ($17,000) that fed a KR Audio Kronzilla SXI integrated amplifier putting out 50 wpc ($25,000). 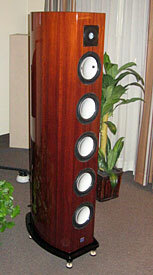 The speakers were Peak Consult Zoltan Signatures ($40,000). There was a lot of great gear in this room, but it didn't come together for me � sounding a little fuzzy. Perhaps it was the least expensive component at the head of the chain. 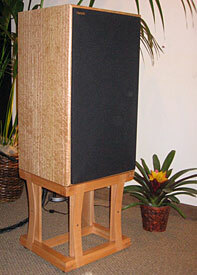 In what might only be considered a gimmick, an audience ClairAudient LSA8 line source array comprised of eight 3-inch full range (40Hz to 22kHz) Audience designed A3 drivers with an S-shaped surround for linear excursion... (phew)... was driven by a $349 Virtue Audio model two amplifier putting out 40 Wpc about the size of a... well, just go to their website. This thing cheats like a Stealth bomber. It is jammed with high tech and designed by Roger Sheker of Audience. Pick a color, buy two, duct tape them to the back of your speakers and wire them for vertical bi-amplifying. Oh, did I mention the separate power supply? We're talking about a $349 integrated amplifier in this room driving a $21,000 pair of speakers. If you need more sound for a larger room (like really large) there is the 16 driver version LSA16 at $33,000. What we really have here is a primo amplifier for a vacation rig. The music sounded great, but the gear was enough to drive me to schizophrenia! Where's Mark Katz when I need him?!?! I had a great time visiting with Keith Herron where I had the opportunity to A-B polarity with his remote controlled tube preamp. The reversal of polarity took on varying degrees of subtlety depending on the music itself and the polarity of the particular cut on my compilation CD. It seems to be an acquired taste that I am better off not acquiring, lest I be forced to get up and reverse the cables on my speakers time and again. The rig itself was entirely Herron, right down to the cables, save for the rim-drive VPI TNT HR-X turntable with JMW-12.7 tonearm ($12,000). M1 monoblocks ($6850 per pair.) 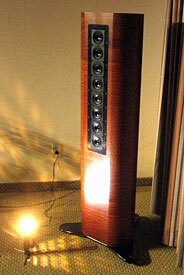 drove the tall 2104A infinite baffle speakers that are yet to reach production. 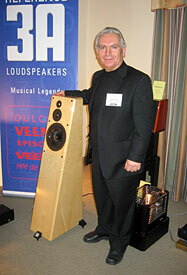 It was interesting to hear the deep and tuneful bass of this sealed loudspeaker. Keith had both his VTSP-3 tube preamp and the new SP-4 Hybrid preamp with two tubes that will be available in the 2nd quarter of this year. The room had a familiar look with all the plants in the corners and the sound was very listenable. For $41,700 you can buy a pair of Consensus Audio's Conspiracy loudspeakers from Austria, which are designed by a man who has many years experience in loudspeaker research and engineering. They were exquisitely finished in an exotic Etimo veneer from Africa � is a sort of African Rosewood that is popular in kitchens and furniture in South Africa. Also available is piano gloss black or other woods. The cabinet's lute shape is designed to control the air flow in conjunction with the port. A plywood spine is visible at the rear where you will also find very significant cable posts. 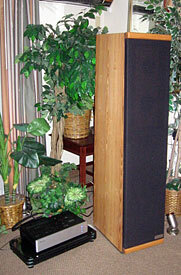 With its ceramic drivers it had a similar sound to the Kharmas, but uses a tuned cabinet rather than inert, damped one. The room was tweaked with Shakti tuning devices and the cables were on risers. Alto-Extremo vibration absorbing footers were also in evidence. The B�sendorfer loudspeakers have been re-invented as Brodman, another piano manufacturer in Vienna, where the loudspeakers are now made. Three sizes range from $6000 to $16,000, although the tall ones seemed shorter than I remembered from the New York show some years ago. With their extra set of tuning panels on each side, these un-damped speakers are designed to resonate and recreate the sound of a concert hall with twin front facing tweeters and twin side firing mid-woofers on each side on the largest model. The full length side grill has been removed to reveal the mid-woofers for the photograph. These speakers have an air of elegance, but the difficult room architecture probably prohibited them from sounding as good as I remembered them from the past. Or it might have been the humble Oppo disc player used as a source. 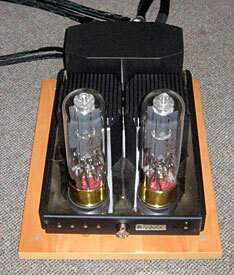 A Viola Cadenza preamp with very cool billet aluminum knobs was also in use. 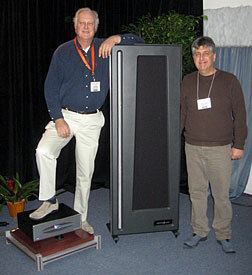 In the Reference 3A room I met Tash Goka and heard the new Episode floorstanding loudspeaker ($5500) that I saw on silent display at Montreal last year. The Episode is positioned between the Grand Veena and the smaller Veena. I liked the sound here a lot. Tash told me that they now have a new Faraday ring on the tweeter in their Dulcet and they will be incorporating that feature in the MM de Capo I in a Mk2 version that may be done in time for the Montreal 2009 show. I'm certainly looking forward to hearing that one. I crossed over to the other side of the Alexis Park and hit the Analysis Audio room where their 66-inches tall planar-ribbon model was driven by Spectron electronics created a huge soundstage with a long slow decay. There are two taller models, going up to 84-inches if you've got the room for it. The music here was luscious, creating the sense of being in a very large space. 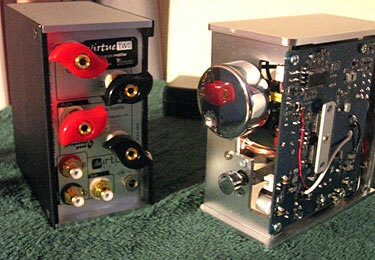 While I usually prefer tube electronics, the Analysis Audio speakers demand a high current amplifier. The Spectron gear presented very little sacrifice, if any. By now it was dark and I headed for the St. Tropez to reconnoiter with my friend Art Shapiro whom I haven't seen in a few years and meet his wife, Joan, for the first time. We decided to walk to a nearby Indian restaurant for dinner. In a typical Las Vegas moment, I spotted this billboard for my namesake's chain of gentleman's clubs. The one here in Las Vegas is perhaps most notable for setting the record at 362 for the most simultaneous lap dances during a single song, in this case, Prince's Exotic City.